Protect your investment with the finest guitar hangers in the industry from Wallacher! Purchase our products here. Practical designs easy to carry! original GUITAR HANGERS MADE IN THE USA! 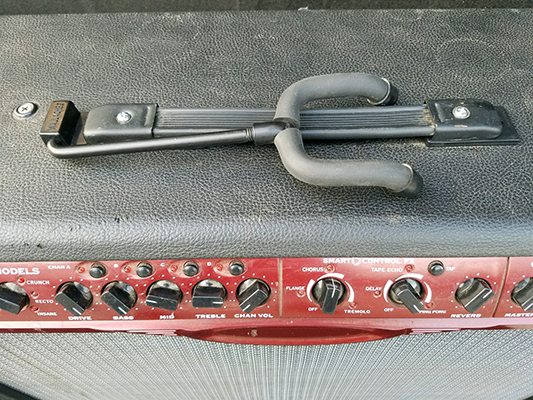 WALLACHER™ offers a wide range of guitar and speaker mounting guitar hangers designed to meet the needs of musicians at home, in the studio, and on the road. These resilient guitar hangers are made to protect your gear, ensure safe storage, and to keep them off the floor. Saves space in cramped spaces. The BOSE Hanger is specially designed to fit the Cylindrical Radiator L1 speaker, and it easily mounts to the speaker column. You can mount more than one at adjustable heights, and it's easily held in place by tightening the provided screw. When transporting, the speaker hanger removes easily for simple storage and transport. 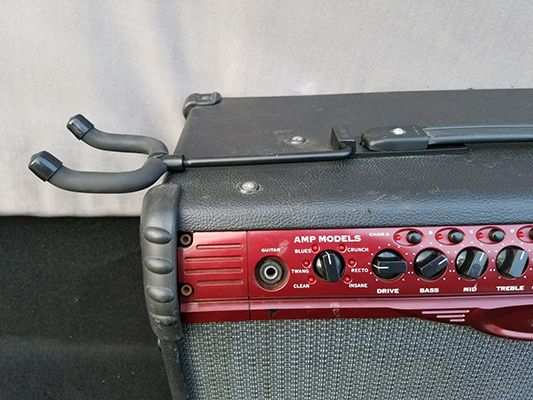 The Amp Mount Hanger slips under the handle using the existing handle screws to attach it. 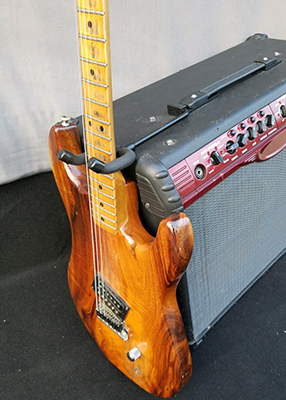 This is a great option for vintage and small amps that allow you to lean your guitar. For larger amps, you can easily hang your guitar. This is an excellent choice for stage use because it can be folded flat and is easy to store in a case, along with your amp. Choose this great alternative to lugging around a freestanding guitar stand. Our original rackmount guitar hanger is great in the studio and onstage. It uses existing rack effect screws and folds flat in front of the rack for easy storage. This sensible space saver is great for even the most demanding tour schedule. This flat folding oak design has a patented folding feature that is excellent for both acoustic and electric guitars. 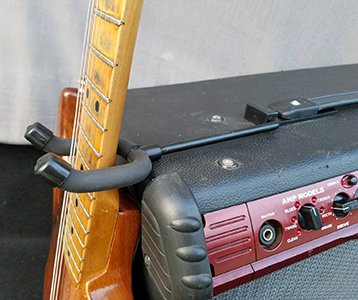 The extra depth makes room for larger acoustic bodies, and it's easily mounted with just three screws, providing a secure hold for your treasured guitar. The "U" shaped yoke pivots to hold almost any head stock shape, and the oak base and padded steel yoke ensure both safety and stability. 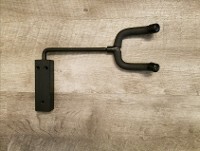 This popular black wall mount hanger is great for any guitar and mounts easily with a single screw on any surface. The yoke pivots to accommodate a range of head stocks and the sturdy, injection molded base and padded steel yoke ensure safety and security for your prized instruments. This basic mount is an excellent option for all guitars, whether electric, acoustic, or bass. 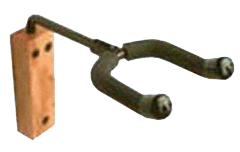 Just one screw allows it to mount to any surface, and the "U" shaped yoke pivots for almost any head stock. The oak base and padded steel yoke ensure safety and stability for any stored guitar. 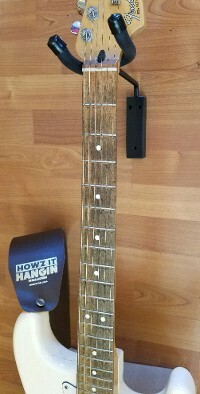 The Original Flat Folding Guitar Hanger is a great, affordable option for hanging guitars on walls and for stage use. The hanger can be mounted on speaker cabinets, half stacks, or amps, and it folds away for easy transportation. 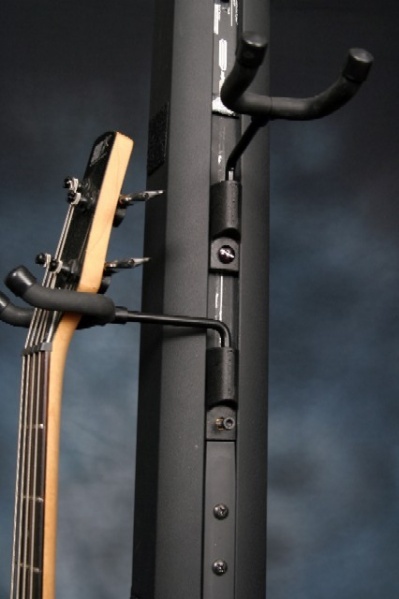 This hanger provides convenience and practicality for the smart musician.